Hello and welcome back to our assessment of the race to the Serie A Golden Boot at the start of February. It is surprising to see that both of last year's winners, Mauro Icardi and Ciro Immobile, are still missing from the top 5. There has been no new entry into the list in the last month, however, there has been a shift in the rankings since our last assessment. Cristiano Ronaldo continues to make the headlines, as he has taken to the Serie A as a fish to water. The Portuguese has added a certain charm to the league ever since his arrival in the summer and has been involved in the Golden Boot race as of late. Cristiano Ronaldo is still a part of this list, but is he still reigning supreme? Read on to find out the top contenders for the "Capocannoniere" at the start of February 2019. The Polish Striker has dropped down the list because he had a rather average January compared to some of the players on this list. When the Serie A resumed after the winter break, Napoli welcomed Lazio for an entertaining encounter. After Callejon had given the home team the lead, Milik doubled the score. His goal ultimately proved to be the match-winner, as Lazio rallied late, got a goal back through Immobile, but could not reduce the deficit. 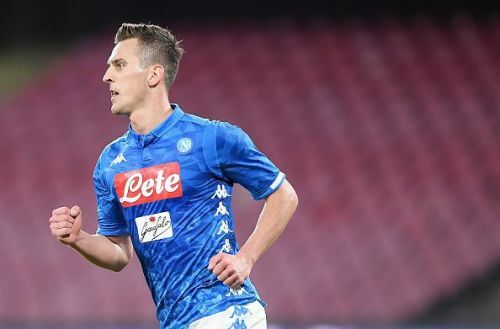 Milik was in the starting XI for the next game against Milan as well, however, he could not find the back of the net and the game ended in a goalless draw. The Polish striker was back among the goals in last weekend against Sampdoria, as his team won 3-0. Napoli are currently second in the Serie A, however, they are 9 points behind league leaders Juventus and any chance of catching them depends on the performance of their in-form striker in the coming months. The Poland International has 12 goals from 19 games and is averaging a goal every 104 minutes played. He has registered 50 shots in the Serie A, 28 of which have been on target. He is currently on a goals-per-game ratio of 0.63. At the start of February, Milik is 5th in the race to the Serie A Golden Boot and is 5 goals behind the man at the top.